In Rapid Software Testing, we say that testing is evaluating a product by learning about it through exploration and experimentation, which includes questioning, modeling, studying, manipulating, making inferences, etc. So learning is an essential part of testing. There are lots of artifacts and people that testers could interact with to start learning about the product, which I’ve discussed already. Let’s look at why making a tester work through test cases might not be such a good approach. Though test cases are touted as a means of learning about the product, my personal experience is that they’re not very helpful at all for that purpose. Have you ever driven somewhere, being guided by a list of instructions from Google Maps, synthesized speech from a navigation system, or even spoken instructions from another person? My experience is that having someone else direct my actions disconnects me from wayfinding and sensemaking. When I get to my destination, I’m not sure how I got there, and I’m not sure I could find my way back. If I want to learn something and have it stick, a significant part of my learning must be self-guided. From time to time, I must make sense of where I’ve been, where I am, and where I’m going. I must experience some degree of confusion and little obstacles along the way. I must notice things that are interesting and important to me that I can connect to the journey. I must have the freedom to make and correct little mistakes. Following detailed instructions might aid in accomplishing certain kinds of tasks efficiently. However, following instructions can get in the way of learning something, and the primary mission of testing is to learn about the product and its status. You could change the assignment by challenging the tester to walk through a set of test cases to find problems in them, or to try to divine the motivation for them, and that may generate some useful insights. But if you really want testers to learn about the product, here’s how I’d do it: give them a mission to learn about the product. Today we’ll look at instances of learning missions that you can apply early in the tester’s engagement or your own. Such missions tend to be broad and open, and less targeted towards specific risks and problems than they might be later. I’ll provide a few examples, with comments after each one. As the principles of context-driven testing note, the product is a solution. If the problem isn’t solved, the product doesn’t work. When the product poses new problems, it might not be working either from the customer’s perspective. Planning meetings tend to be focused on envisioning success; on intention. Those meetings present opportunities to talk anticipating failure; on how we or the customer might not achieve our goals, or might encounter problems. Planning a product involves planning ways of noticing how it might go wrong, too. There’s a common misconception about testing: that testers look for inconsistencies between the product and a description of the product, and that’s all. But excellent testers look at the product, at descriptions of the product, and at intentions for the product, and seek inconsistencies between all of those things. Many of our intentions are tacit, not explicit. Note also that the designer’s model of the user’s task may be significantly different from the user’s model. Notice that each example above includes an information mission. Each one includes a mandate to produce specific, reviewable artifacts, so that the tester’s learning can be evaluated with conversation and documented evidence. Debriefing and relating learning to others is an important part of testing in general, and session-based test management in particular. Each example also involves collaboration with other people on the team, so that inconsistencies between perspectives can be identified and discussed. And notice: these are examples. They are not templates to be followed. It’s important that you develop your own missions, suited to the context in which you’re working. At early stages of the tester’s engagement, finding problems is not the focus. Learning is. Nonetheless, as one beneficial side effect, the learning may reveal some errors or inconsistencies before they can turn into bugs in the product. 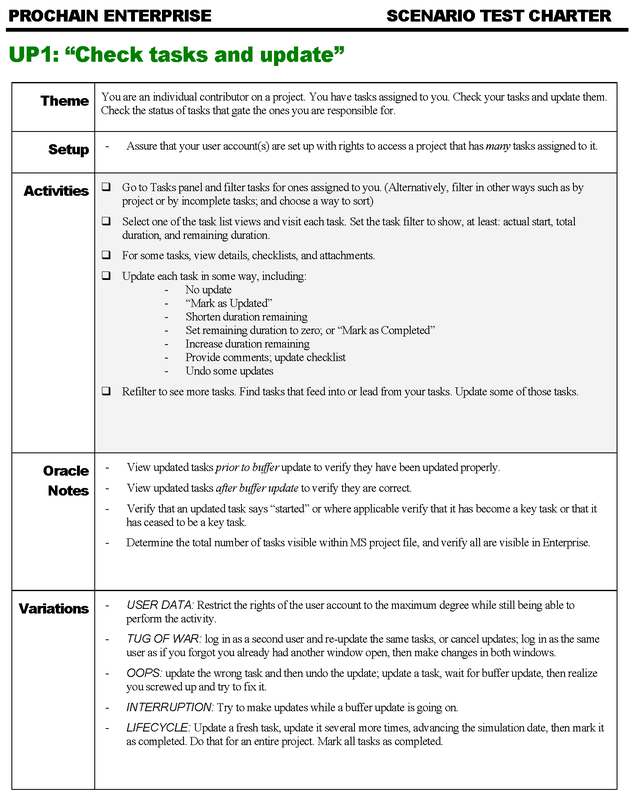 As another benefit, testers and teams can collect ideas for product and project risk lists. Finally, the learning might reveal test conditions that can usefully be checked with tools, or that might be important to verify via explicit procedures. Back to the coaching session. “Sometimes managers say that it’s important to give testers explicit instructions when we’re dealing with an offshore team whose first language is not English”, said Frieda. Would test cases really make that problem go away? Presumably the test cases and the product would be written in English too. If the testers don’t understand English well, then they’ll scarcely be able to read the test cases well, or to comprehend the requirements or the standards, or to understand what the product is trying to tell them through its (presumably also English) user interface. Maybe the product and the surrounding artifacts are translated from English into the testers’ native language. That addresses one kind of problem, but introduces a new one: requirements and specifications and designs and jargon routinely get misinterpreted even when everyone is working in English. When that material is translated, some meaning is inevitably changed or lost in translation. All of these problems will need attention and management. If a product does something important, presumably there’s a risk of important problems, many of which will be unanticipated by test cases. Wouldn’t it be a good idea to have skilled testers learn the product reasonably rapidly but also deeply to prepare them to seek and recognize problems that matter? When testers are up and running on a project, there are several approaches towards focusing their work without over-focusing it. I’ve mentioned a few already. We’ll look at another one of those next. Note: this post is long from the perspective of the kitten-like attention spans that modern social media tends to encourage. Fear not. Reading it could help you to recognize how you might save you hours, weeks, months of excess and unnecessary work, especially if you’re working as a tester or manager in a regulated environment. Testers frequently face problems associated with excessive emphasis on formal, procedurally scripted testing. Politics, bureaucracy, and paperwork combine with fixation on test cases. Project managers and internal auditors mandate test cases structured and written in a certain form “because FDA”. When someone tells you this, it’s a pretty good indication that they haven’t read the FDA’s guidance documentation. For each of the software life cycle activities, there are certain “typical” tasks that support a conclusion that the software is validated. 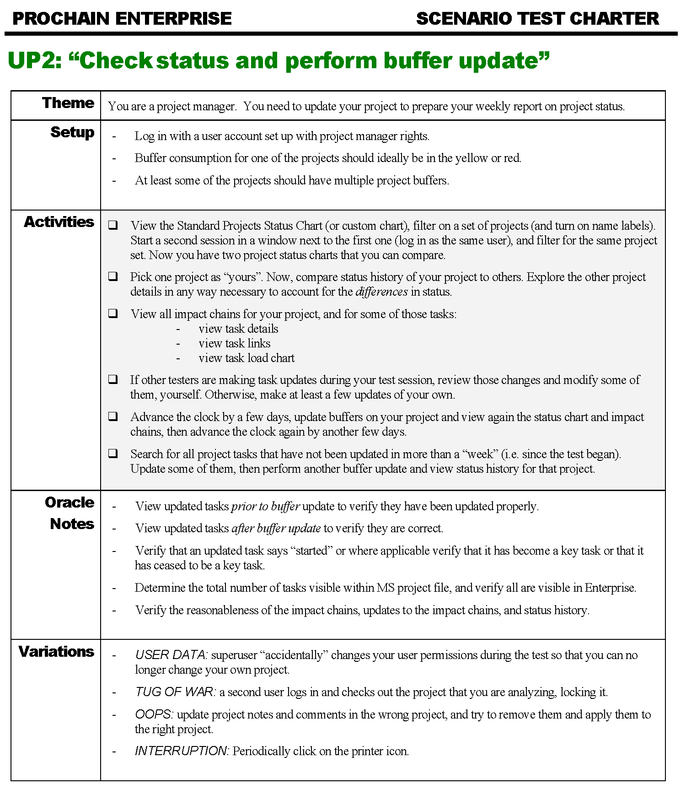 However, the specific tasks to be performed, their order of performance, and the iteration and timing of their performance will be dictated by the specific software life cycle model that is selected and the safety risk associated with the software application. For very low risk applications, certain tasks may not be needed at all. However, the software developer should at least consider each of these tasks and should define and document which tasks are or are not appropriate for their specific application. The following discussion is generic and is not intended to prescribe any particular software life cycle model or any particular order in which tasks are to be performed. The General Principles of Software Validation document is to some degree impressive for its time, 2002. It describes some important realities. Software problems are mostly due to design and development, far less to building and reproduction. Even trivial programs are complex. Testing can’t find all the problems in a product. Software doesn’t wear out like physical things do, and so problems often manifest without warning. Little changes can have big, wide-ranging, and unanticipated effects. Using standard and well-tested software components addresses one kind of risk, but integrating those components requires careful attention. There are lots of problems with General Principles of Software Validation document, too. I’ll address several of these, I hope, in future posts. If you choose to interpret “test case” as an artifact, and consider that challenge sufficient, this would be pretty terrible advice. It would be analogous to saying that children should be fed with recipes, or that buildings should be constructed with blueprints. A shallow reading could suggest that the artifact and the performance guided by that artifact are the same thing; that you prepare the recipe before you find out what the kids can and can’t eat, and what’s in the fridge; that you evaluate the building by comparing it to the blueprints and then you’re done. On the other hand, if you substitute “test cases” with “tests” or “testing”, it’s pretty great advice. It’s a really good idea to challenge a software product with tests, with testing, based on internal and external perspectives. The FDA does not define “test case” in the guidance documentation. A definition does appear in Glossary of Computer System Software Development Terminology (8/95). test procedure (NIST) A formal document developed from a test plan that presents detailed instructions for the setup, operation, and evaluation of the results for each defined test. See: test case. So it is pretty terrible advice after all. We believe we should consider the least burdensome approach in all areas of medical device regulation. This guidance reflects our careful review of the relevant scientific and legal requirements and what we believe is the least burdensome way for you to comply with those requirements. However, if you believe that an alternative approach would be less burdensome, please contact us so we can consider your point of view. The “careful review” happened in the period leading up to 2002, which is the publication date of this guidance document. In testing community of those days, anything other than ponderously scripted procedural test cases were viewed with great suspicion in writing and conference talks. Thanks to work led by Cem Kaner, James Bach, and other prominent voices in the testing community, the world is now a safer place for exploration in testing. And, as noted in the previous post in this series, the FDA itself has acknowledged the significance and importance of exploratory work. The device consisted of a Control Box, operated by a technician. The Control Box was connected to a Zapper Box that delivered Healing Energy to the patient’s body. (We’ve modified some of the specific words and language here to protect confidentiality and to summarize what the devices do.) Insufficient Healing Energy is just Energy. Too much Healing Energy, or the right amount for too long, turns into Hurting Energy or Killing Energy. 9.8.1.1 Connect the components according to the General Setup document. 9.8.1.2 Power on and connect Power Monitor (instead of electrodes). 9.8.1.3 Power on the Zapper Box. 9.8.1.4 Power on the Control Box. 9.8.1.5 Set default settings of temperature and power for zapping. 9.8.1.6 Set test jig load to nominal value. 9.8.1.7 Select nominal duration and nominal power setting. 9.8.1.8 Press the Start button. 9.8.1.9 Verify Zapper reports the power setting value ±10% on display. Is this good formal testing? It’s certainly a formal procedure to follow, but where’s the testing part? The closest thing is that little molecule of actual testing in the last line: the tester is instructed to apply an oracle by comparing the power setting on the Control Box with what the Zapper reports on its display. There’s nothing to suggest examining the actual power being delivered by noting the results from the Power Monitor. There’s nothing about inducing variation to obtain and extend coverage, either. At one point, James and another tester defrosted this procedure. They tried turning on the Control Box first, and then waited for a variety of intervals to turn on the Zapper Box. To their amazement, the Zapper Box could end up in one of four different states, depending on how long they waited to start it—and at least a couple of those states were potentially dangerous to the patient or to the operator. In the test descriptions that follow, the word “verify” is used to highlight specific items that must be checked. In addition to those items a tester shall, at all times, be alert for any unexplained or erroneous behavior of the product. The tester shall bear in mind that, regardless of any specific requirements for any specific test, there is the overarching general requirement that the product shall not pose an unacceptable risk of harm to the patient, including any unacceptable risks due to reasonably foreseeable misuse. Read that paragraph carefully, sentence by sentence, phrase by phrase. Notice the emphasis on looking for problems and risks—especially on the risk of human error. The tester shall be thoroughly familiar with the Zapper Box and Control Box Functional Requirements Specification, as well as with the working principles of the devices themselves. The tester shall also know the working principles of the Power Monitor Box test tool and associated software, including how to configure and calibrate it, and how to recognize if it is not working correctly. The tester shall have sufficient skill in data analysis and measurement theory to make sense of statistical test results. The tester shall be sufficiently familiar with test design to complement this protocol with exploratory testing, in the event that anomalies appear that require investigation. The tester shall know how to keep test records to credible, professional standard. In summary: Be a scientist. Know the domain, know the tools, be an analyst, be an investigator, keep good lab notes. 3.2.2.1 With the Power Monitor test tool already running, start the Zapper Box and the Control Box. Vary the order and timing in which you start them, retain the Control Box and Power Monitor log files, and note any inconsistent or unexpected behaviour. 3.2.2.2 Visually inspect the displays and verify conformance to the requirements and for the presence of any behaviour or attribute that could impair the performance or safety of the product in any material way. 3.2.2.3 With the system settings at default values change the contents of every user-editable field through the range of all possible values for that field. (e.g. Use the knob to change the session duration from 1 to 300 seconds.) Visually verify that appropriate values appear and that everything that happens on the screen appears normal and acceptable. 3.2.2.4 Repeat 3.2.2.3 with system settings changed to their most extreme possible values. 3.2.2.5 Select at least one field and use the on-screen keyboard, knob, and external keyboard respectively to edit that field. 3.2.2.6 Scan the Control Box and Power Monitor log files for any recorded error conditions or anomalies. 3.5.2.3 From the Power Monitor log file, extract the data for the measured electrode. This sample should comprise the entire power session, including cooldown, as well as the stable power period with at least 50 measurements (i.e., taken at least five times per second over 10 seconds of stable period data). 3.5.2.4 From the Control Box log file, extract the corresponding data for the stable power period of the measured electrode. 3.5.2.5 Calculate the deviation by subtracting the reported power for the measured electrode from the corresponding Power Monitor reading (use interpolation to synchronize the time stamp of the power meter and generation logs). 3.5.2.6 Calculate the mean of the power sample X (bar) and its standard deviation (s). Now, that’s some real formal testing. And it was accepted just fine by the organization and the FDA auditors. Better yet, and following this protocol revealed some surprising behaviours that prompted more careful evaluation of the requirements for the product. What are some lessons we could learn from this? One key point, it seems to me, is that when you’re working as a tester in a regulated environment, it’s crucial that you read the regulations and the guidance documentation. If you don’t, you run the risk of being pushed around by people who haven’t read them, and who are working on the basis of mythology and folklore. Our over-arching mission as testers is to seek and find problems that threaten the value of the product. In contexts where human life, health, or safety are on the line, the primary job at hand is to learn about the product and problems that post risks and hazards to people. Excessive bureaucracy and paperwork can distract us from that mission; even displace it. Therefore, we must find ways to do the best testing possible, while still providing the best and least evidence that still completely satisfies auditors and regulators that we’ve done it. “What does ‘up to speed’ actually mean?” I asked. The error in this line of thinking is that testing is about pushing buttons; producing widgets on a production line; flipping testburgers. If you treat testing as flipping testburgers, then there’s a risk that testers will flip whatever vaguely burger-shaped thing comes their way… burgers, frisbees, cow pies, hockey pucks… You may not get the burger you want. If you think of testing as an investigation of the product, testers must be investigators, and skillful ones at that. Upon engaging with the product and the project, testers set to learning about the product they’re investigating and the domain in which it operates. Testers keep excellent lab notes and document their work carefully, but not to the degree that documentation displaces the goal of testing the system and finding problems in it. Testers are focused on risk, and trained to be aware of problems that they might encounter as they’re testing (per CFR Title 21 Part 820.25 (b)(2)) . If they’re not sufficiently skilled when you hire them, you’ll supervise and train them until they are. And if they’re unskilled and can’t be trained… are you really sure you want them testing a device that could deliver Killing Energy? How else might you guide testing work, whether in projects in regulated contexts or not? That’s a topic for next time. In the previous post, “Frieda”, my coaching client, asked about producing test cases for auditors or regulators. In Rapid Software Testing (RST), we find it helpful to frame that in terms of formal testing. Some terminology notes: checking is the process of operating and observing a product; applying decision rules to those observations; and then reporting on the outcome of those rules; all mechanistically, algorithmically. A check can be turned into a formally scripted process that can be performed by a human or by a machine. Procedurally scripted test cases are instances of human checking, where the tester is being substantially guided by what the script tells her to do. Since people are not machines and don’t stick to the algorithms, people are not checking in the strictest sense of our parlance. A human transceiver is someone doing things based only on the instructions of some other person, behaving as that person’s eyes, ears, and hands. Machine checking is the most formal mode of testing, in that machines perform checks in entirely specific ways, according to a program, entirely focused on specific facts. The motivation to check doesn’t come from the machine, but from some person. Notice that programs are formal, but programming is an informal activity. Toolsmiths and people who develop automated checks are not following scripts themselves. The degree to which you formalize is a choice, based on a number of context factors. Your context guides your choices, and both of those evolve over time. One of the most important context factors is your mission. You might be in a regulated environment, where regulators and auditors will eventually want you to demonstrate specific things about the product and the project in a highly formal way. If you are in that context, keeping the the auditors and the regulators happy may require certain kinds of formal testing. Nonetheless, even in that context, you must perform informal testing—lots of it—for at least two big reasons. The first big reason is to learn the about the product and its context to prepare for excellent formal testing that will stand up to the regulators’ scrutiny. This is tied to another context factor: where you are in the life of the project and your understanding of the product. Formal testing starts with informal work that is more exploratory and tacit, with the goal of learning; less scripted and explicit, with the goal of demonstrating. All the way along, but especially in between those poles, we’re searching for problems. No less than the Food and Drug Administration emphasizes how important this is. Thorough and complete evaluation of the device during the exploratory stage results in a better understanding of the device and how it is expected to perform. This understanding can help to confirm that the intended use of the device will be aligned with sponsor expectations. It also can help with the selection of an appropriate pivotal study design. The pivotal stage of device development, says the FDA, focuses on developing what people need to know to evaluate the safety and effectiveness of a product. The pivotal stage usually consists of one or more pivotal studies. In other words, the FDA acknowledges that development happens in loops and cycles; that development is an iterative process. James Bach emphasized this in his talk The Dirty Secret of Formal Testing and it’s an important point in RST. Development is an iterative process because at the beginning of any cycle of work, we don’t know for sure what all the requirements are; what they mean; what we can get; and how we might decide that we’ve got it. We don’t really know that until we’ve until we’ve tested the product… and we don’t know how to test the product until we’ve tried to test the product! Just like developing automated checks, developing formally scripted test cases is an informal process. You don’t follow a script when you’re interpreting a specification; when you’re having a conversation with a developer or a designer; when you’re exploring the product and the test space to figure out where checking might be useful or important. You don’t follow a script when you recognize a new way of using tools to learn something about the product, and apply them. And you don’t follow a script when you investigate bugs that you’ve found—either during informal testing or the formal testing that might follow it. If you try to develop formal procedural test cases without testing the actual product, they stand a good chance of being out of sync with it. The dirty secret of format testing is that all good formal testing begins with informal testing. It might be a very good idea for programmers to develop some automated checks that helps them with the discipline of building clean code and getting rapid feedback on it. It’s also a good idea for developers, designers, testers, and business people to develop clear ideas about intentions for a product, envisioning success. It might also be a good idea to develop some automated checks above the unit level and apply them to the build process—but not too many and certainly not too early. The beginning of the work is usually a terrible time for excessive formalization. Which brings us to the second big reason to perform informal testing continuously throughout any project: to address the risk that our formal testing to date will fail to reveal how the product might disappoint customers; lose someone’s money; blow something up; or hurt or kill people. We must be open to discovery, and to performing the testing and investigation that supports it, all the way throughout the project, because neither epiphanies nor bugs follow scripts or schedules. The overarching mission of testing is focused on a question: “are there problems that threaten the value of the product, or the on-time, successful completion of our work?” That’s not a question that formal testing can ever answer on its own. 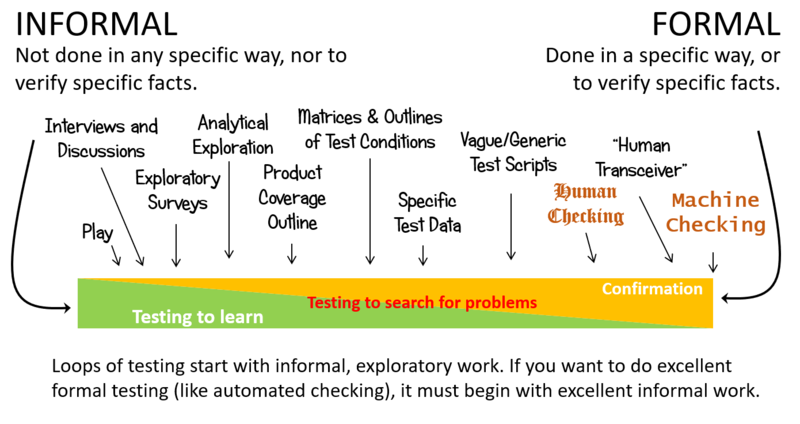 Fixation on automated checks or test cases runs the risk of displacing time for experimentation, exploration, discovery, and learning. Next time, we’ll look at an example of breaking test case addiction on a real medical device project. Stay tuned. Why do some tech leaders (for example, CTOs, development managers, test managers, and test leads) jump straight to test cases when they want to provide traceability, share testing efforts with stakeholders, and share feature knowledge with testers? I’m not sure. I fear that most of the time, fixation on test cases is simply due to ignorance. Many people literally don’t know any other way to think about testing, and have never bothered to try. Alarmingly, that seems to apply not only to leaders, but to testers, too. Much of the business of testing seems to limp along on mythology, folklore, and inertia. Testing, as we’ve pointed out (many times), is not test cases; testing is a performance. Testing, as we’ve pointed out, is the process of learning about a product through exploration and experimentation, which includes to some degree questioning, studying, modeling, observation, inference, etc. You don’t need test cases for that. There may be specific conditions, elements of the product, notions of quality, interactions with other products, that we’d like to examine during a test, or that might change the outcome of a test. Keeping track of these could be very important. Is a procedurally scripted test case the only way to keep track? The only way to guide the testing? The best way? A good way, even? Let’s look at alternatives for addressing the leaders’ desires (traceability, shared knowledge of testing effort, shared feature knowledge). Traceability. It seems to me that the usual goal of traceability is be able to narrate and justify your testing by connecting test cases to requirements. From a positive perspective, it’s a good thing to make those connections to make sure that the tester isn’t wasting time on unimportant stuff. On the other hand, testing isn’t only about confirming that the product is consistent with the requirements documents. Testing is about finding problems that matter to people. Among other things, that requires us to learn about things that the requirements documents get wrong or don’t discuss at all. If the requirements documents are incorrect or silent on a given point, “traceable” test cases won’t reveal problems reliably. For that reason, we’ve proposed a more powerful alternative to traceability: test framing, which is the process of establishing and describing the logical connections between the outcome of the test at the bottom and the overarching mission of testing at the top. Requirements documents and test cases may or may not appear in the chain of connections. That’s okay, as long as the tester is able to link the test with the testing mission explicitly. In a reasonable working environment, much of the time, the framing will be tacit. If you don’t believe that, pause for a moment and note how often test cases provide a set of instructions for the tester to follow, but don’t describe the motivation for the test, or the risk that informs it. Some testers may not have sufficient skill to describe their test framing. If that’s so, giving test cases to those testers papers over that problem in an unhelpful and unsustainable way. A much better way to address the problem would, I believe, would be to train and supervise the testers to be powerful, independent, reliable agents, with freedom to design their work and responsibility to negotiate it and account for it. Sharing efforts with stakeholders. One key responsibility for a tester is to describe the testing work. Again, using procedurally scripted test cases seems to be a peculiar and limited means for describing what a tester does. The most important things that testers do happen inside their heads: modeling the product, studying it, observing it, making conjectures about it, analyzing risk, designing experiments… A collection of test cases, and an assertion that someone has completed them, don’t represent the thinking part of testing very well. A test case doesn’t tell people much about your modeling and evaluation of risk. A suite of test cases doesn’t either, and typical test cases certainly don’t do so efficiently. A conversation, a list, an outline, a mind map, or a report would tend to be more fitting ways of talking about your risk models, or the processes by which you developed them. Perhaps the worst aspect of using test cases to describe effort is that tests—performances of testing activity—become reified, turned into things, widgets, testburgers. Effort becomes recast in terms of counting test cases, which leads to no end of mischief. If you want people to know what you’ve done, record and report on what you’ve done. Tell the testing story, which is not only about the status of the product, but also about how you performed the work, and what made it more and less valuable; harder or easier; slower or faster. Sharing feature knowledge with testers. There are lots of ways for testers to learn about the product, and almost all of them would foster learning better than procedurally scripted test cases. 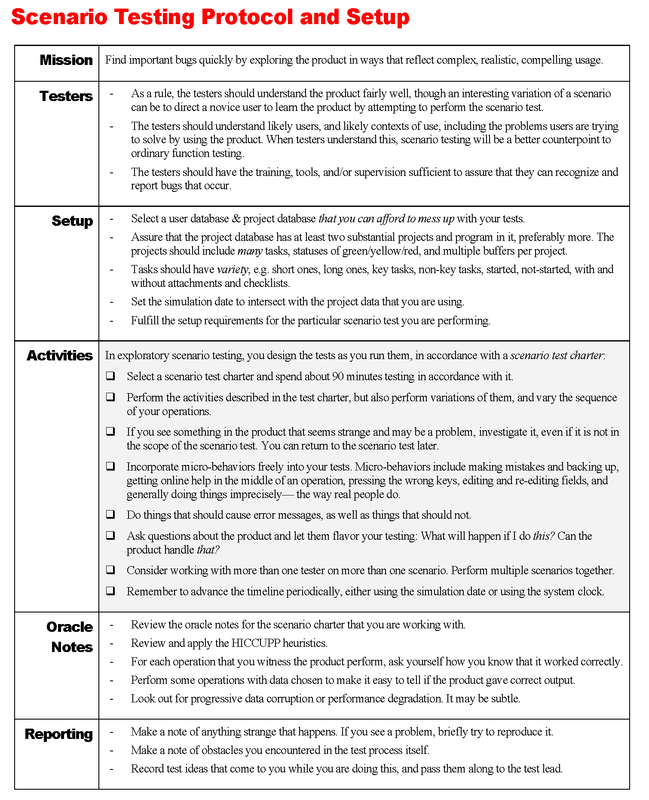 Giving a tester a script tends to focus the tester on following the script, rather than learning about the product, how people might value it, and how value might be threatened. Give the tester the mission to learn something based on one or more of these things. Require the tester to take notes, and then to provide some additional evidence of what he or she learned. Perhaps some people are concerned not that there’s too little information, but too much. A corresponding worry might be that the available information is inconsistent. When important information about the product is missing, or unclear, or inconsistent, that’s a test result with important information about the project. Bugs breed in those omissions or inconsistencies. Then review the tester’s work. Provide feedback, coaching and mentoring. Offer praise where the tester has learned something well; course correction where the tester hasn’t. Testers will get a lot more from this interactive process than from following step-by-step instructions in a test case. My coaching client had some more questions about test cases. We’ll get to those next time. What actually happens when a check returns a “red” result? First, we ask, “Is the check really returning a red?” The check provides us with a result which signals some kind of information, but by design the check hides lots of information too. The key here is that we want to see the problem for ourselves and apply human sensemaking to the result and to the possibility of a real problem. focused on extracted cues (extracted cues are simple, familiar bits of information that lead to a larger sense of what is occurring, like “Flimsy!->Won’t last!” or “Shouting, with furrowed brow!->Angry!” or “Check returns red!->Problem!”). The reason that we need to apply sensemaking is that it’s never clear that a check is signaling an actual problem in the product. Maybe there’s a problem in the instrumentation, or a mistake in the programming of the check. So when we see a “red” result, we try to make sense of it by seeking more information (or examining other extracted cues, as Weick might say). If the second result isn’t consistent with the first, we might perform the check again several times, to see if the result recurs only occasionally and intermittently. We might look for secondary indicators of the problem, other oracles or other evidence that supports or refutes the result of the check. If we’re convinced that the check is really red, we then ask “where is the trouble?” The trouble might be in the product or in the check. We might inspect the state of our instrumentation, to make sure that all of the equipment is in place and set up correctly. We might work our way back through the records produced by the check, tracing through log files for indications of behaviours and changes of state, and possible causes for them. We might perform the check slowly, step by step, observing more closely to see where the things went awry. We might step through the code in the debugger, or perform a procedure interactively instead of delegating the activity to the machinery. We might perform the check with different values, to assess the extents or limits of the problem. We might perform the check using different pacing or different sequences of actions to see if time is a factor. Next, if the check appears to be producing a result that makes sense—the check is accurately identifying a condition that we programmed it to identify—it might be easy to conclude that there’s a bug, and now it’s time to fix it. But we’re not done, because although the check is pointing to an inconsistency between the actual state of the product and some programmed result, there’s yet another decision to be made: is that inconsistency a problem with respect to something that someone desires? In other words, does that inconsistency matter? Maybe the check is archaic, checking for some condition that is no longer relevant, and we don’t need it any more. Maybe the check is one of several that are still relevant, but this specific check wrong in some specific respect. Perhaps something that used to be permitted is now forbidden, or vice versa. When the check returns a binary result based on a range of possible results, we might ask “is the result within a tolerable range?” In order to do that, we might have to revisit our notions of what is tolerable. Perhaps the output deviated from the range insignificantly, or momentarily; that is, the check may be too restrictive or too fussy. Maybe the check has been not been set up with explicit pass/fail criteria, but to alert us about some potentially interesting condition that is not necessarily a failure. In this case, the check doesn’t represent a problem per se, but rather a trigger for investigation. We might look outside of the narrow scope of the check to see if there’s something important that the check has overlooked. We might do this interactively, or by applying different checks. In the process of developing the check, we were testing (evaluating the product by learning about it through exploration and experimentation). The check itself happens mechanically, algorithmically. As it does so, it projects a complex, multi-dimensional space down to single-dimensional result, “red” or “green”. In order to make good use of that result, we must unpack the projection. After a red result, the check turns into the centre of a test as we hover over it and examine it. In other words, the red check result typically prompts us to start testing again. That’s what usually happens when a check returns a “red” result. What happens when it returns nothing but “green” results? This article was originally published in the February 2015 edition of Testing Trapeze, an excellent online testing magazine produced by our testing friends in New Zealand. There are small edits here from the version I submitted. Once upon a time, before I was a tester, I worked in theatre. Throughout my career, I took on many roles—but maybe not in the way you’d immediately expect. In my early days, I was a performer, acting in roles in the sense that springs to mind for most people when they think of theatre: characters in a play. Most of the time, though, I was in the role of a stage manager, which is a little like being a program manager in a software development group. Sometimes my role was that of a lighting designer, sound engineer, or stagehand. I worked in the wardrobe of the Toronto production of CATS for six months, too. a second-order role that the person takes on when he arrives at the theatre, defocusing from his day-to-day role as a husband and father, and focusing his energy on being an actor, or stagehand, or lighting designer. He typically holds that second-order role over the course of the working day, and abandons it when it’s time to go home. a third-order role that the actor performs as a specific character at some point during the show. In many cases, the actor takes on one character per performance. Occasionally an actor takes on several different characters throughout the course of the performance, playing a new third-order role from one moment to another. In an improvisational theatre company, a performer may pick up and drop third-order roles as quickly as you or I would don or doff a hat. In a more traditional style of theatre, roles are more sharply defined, and things can get confusing when actors suddenly and unexpectedly change roles mid-performance. It’s natural and normal to deal simultaneously with roles of different orders, but it’s hard to handle two roles of the same order at exactly the same time. For example, a person may be both a member of a theatre company and a parent, but it’s not easy to supervise a child while you’re on stage in the middle of a show. In a small theatre company, the same person might hold two second-order roles—as both an actor and a costume designer, say—but in a given moment, that person is focusing on either acting or costume design, but not both at once. People in a perfomer role tend not to play two different third-order roles—two different characters—at the same moment. There are rare exceptions, as in those weird Star Trek episodes or in movies like All of Me, in which one character is inhabiting the body of another. To perform successfully in two simultaneous third-order roles takes spectacular amounts of discipline and skill, and the occasions where it’s necessary to do so aren’t terribly common. Some roles are more temporary than others. At the end of the performance, people drop their second-order roles to go home and live out their other, more long-term roles; husbands and wives, parents, daughters and sons. They may adopt other roles too: volunteer in the community soup kitchen; declarer in this hand of the bridge game; parishioners at the church; pitcher on the softball team. Roles can be refined and redefined; in a dramatic television series, an actor performs in a third-order role in each episode, as a particular character. If it’s an interesting character, aspects of the role change and develop over time. At the end of the run of a show, people may continue in their first-order roles with the same theatre company; they may become directors or choreographers with that company; or they may move on to another role in another company. They may take on another career altogether. Other roles evolve too, from friend to lover to spouse to parent. In theatre, a role is an identity that a person takes to fulfill some purpose in service of the theatre company, production, or the nightly show. More generally, a role is a position or function that a person adopts and performs temporarily. A role represents a set of services offered, and often includes tacit or explicit commmitments to do certain things for and with other people. A role is a way to summarize ideas about services people offer, activities they perform, and the goals that guide them. Now: to software. As a member of a software development team within an organization, I’m an individual contributor. In that first-order role, I’m a generalist. I’ve been a program manager, programmer, tech support person, technical writer, network administrator, and phone system administrator, business owner, bookkeeper, teacher, musician… Those experiences have helped me to be aware of the diversity of roles on a project, to recognize and respect the the people who perform them, and to be able to perform them effectively to some extent if necessary. In the individual contributor role, I commit to taking on work to help the company to achieve success, just as (I hope) everyone else in the company does. Normally I’m taking on the everyday, second-order role of a tester, just as member of a theatre company might walk through the door in the evening as a lighting technician. By adopting the testing role, I’m declaring my commitment to specialize in providing testing services for the project. That doesn’t limit me to testing, of course. If I’m asked, I might also do some programming or documentation work, especially in small development groups—just as an actor in a very small theatre company might help in the box office and take ticket orders from time to time. Nonetheless, my commitment and responsibility to provide testing services requires me to be very cautious about taking on things outside the testing role. When I’m hired as a tester, my default belief is that there’s going to be more than enough testing work to do. If I’m being asked to perform in a different role such that important testing work might be neglected or compromised, I must figure out the priorities with my client. Within my testing role, I might take on a third-order role as a responsible tester (James Bach has blogged on the role of the responsible tester) for a given project, but I might take on a variety of third-order roles as a test jumper (James has blogged about test jumpers, too). Like parts of an outfit that I choose to wear, a role is a heuristic that can help to suggest who I am and what I do. In a hospital, the medical staff are easy to identify, wearing uniforms, lab coats, or scrubs that distinguish them from civilian life. Everyone wears badges that allow others to identify them. Surgical staff wear personalized caps—some plain and ordinary, others colourful and whimsical. Doctors often have stethoscopes stuffed into a coat pocket, and certificates from medical schools on their walls. Yet what we might see remains a hint, not a certainty; someone dressed like a nurse may not be a nurse. The role is not a guarantee that the person is qualified to do the work, so it’s worthwhile to see if the garb is a good fit for the person wearing it. The “team member” role is one thing; the role within the team is another. In a FIFA soccer match, the goalkeeper is dressed differently to make the distinct role—with its special responsibilities and expectations—clearly visible to everyone else, including his team members. The goalkeeper’s role is to mind the net, not to run downfield trying to score goals. There’s no rule against a goalie trying to do what a striker does, but to do so would be disruptive to the dynamics of the team. When a goalkeeper runs downfield trying to score goals, he leaves the net unattended—and those who chose to defend the goal crease aren’t allowed to use their hands. In well-organized, self-organized teamwork, roles help to identify whether people are in appropriate places. If I’m known as a tester on the project and I am suddenly indisposed, unavailable, or out of position, people are more likely to recognize that some of the testing work won’t get done. Conversely, if someone else can’t fulfill their role for some reason, I’m prepared to step up and volunteer to help. Yet to be helpful, I need to coordinate consistently with the rest of the team to make sure our perceptions line up. On the one hand, I may not have have noticed important and necessary work. On the other, I don’t want to inflict help on the project, nor would it be respectful or wise for me to usurp anyone else’s role. Shifting positions to adapt to a changing situation can be a lot easier when roles help to frame where we’re coming from, where we are, and where we’re going. I also (metaphorically) study escape artistry in the unlikely event that someone manages to constrain me. When I adopt a role, I must do so voluntarily, understanding the commitment I’m making and believing that I can perform it well—or learn it in a hurry. I might temporarily adopt a third-order role normally taken by someone else, but in the long run, I can’t commit to a role without full and ongoing understanding, agreement, and consent between me and my clients. If I resist accepting a role, I don’t do so capriciously or arbitrarily, but for deeply practical reasons related to three important problems. The Expertise Problem. I’m willing to do or to learn almost anything, but there is often work for which I may be incompetent, unprepared or underqualified. Each set of tasks in software development requires a significant and distinct set of skills which must be learned and practiced if they are to be performed expertly. I don’t want fool my client or my team into believing that the work will be done well until I’m capable, so I’ll push back on working in certain roles unless my client is willing to accept the attendant risks. I believe I can perform competently, adequately, eventually, in any role. Yet competence and adequacy aren’t enough when I aspire to achieving excellence and mastery. At a certain point in my life, I decided to focus my time and energy on testing and the teaching of it; the testing and teaching roles are the ones that attract me most. Their skills are the ones that I am most interested in trying to master—just as others are focused on mastering programming skills. So: roles represent a heuristic for focusing my development of expertise, and for distributing expertise around the team. The Mindset Problem. Building a product demands a certain mindset; testing it deeply demands another. When I’m programming or writing (as I’m doing now), I tend to be in the builder’s mindset. As such, I’m at close “critical distance” to the work. I’m seeing it from the position of an insider—me—rather than as an outsider. When I’m in the builder’s mindset, it’s relatively easy for me to perform shallow testing and spot coding errors, or spelling and grammatical mistakes—although after I’ve been looking at the work for a while, I may start to miss those as well. In the builder’s mindset, it’s quite a bit harder for me to notice deeper structural or thematic problems, because I’ve invested time and energy in building the piece as I have, converging towards something I believe that I want. To see deeper problems, I need the greater critical distance that’s available in the tester’s mindset—what testers or editors do. It’s not a trivial matter to switch between mindsets, especially with respect to one’s own work. Switching mindsets is not impossible, but shifting from building into good critical and analytical work is effortful and time-consuming, and messes with the flow. One heuristic for identifying deep problems in my writing work would be to walk away from writing—from the builder’s mindset—and come back later with the tester’s mindset—just as I’ve done several times with this essay. However, the change in mindset takes time, and even after days or weeks, part of me remains in the writer’s mindset—because it’s my writing. Similarly, a programmer in the flow of developing a product may find it disruptive—both logistically and intellectually—to switch mindsets and start looking for problems. In fact, the required effort likely explains a good deal of some programmers’ stated reluctance to do deep testing on their own. So another useful heuristic is for the builder to show the work to other people. As they are different people, other builders naturally have critical distance, but that distance gets emphasized when they agree to take on a testing role. I’ve done that with this article too, by enlisting helpers—other writers who adopt the roles of editors and reviewers. A reviewer might usually identify herself as a writer, just as someone in a testing role might normally identify as a programmer. Yet temporarily adopting a reviewer’s role and a testing mindset frames the approach to the task at hand—finding important problems in the work that are harder to see quickly from the builder’s mindset. In publishing, some people by inclination, experience, training, and skills specialize in editing, rather than writing. The editing role is analogous to that of the dedicated tester—someone who remains consistently in the tester’s mindset, at even farther critical distance from the work than the builder-helpers are—more quickly and easily able to observe deep, rare, or subtle problems that builders might not notice. The Workspace Problem. Tasks in software development may require careful preparation, ongoing design, and day-to-day, long-term maintenance of environments and tools. Different jobs require different workspaces. Programmers, in the building role, set up their environments and tools to do development and building work most simply and efficiently. Setting up a test lab for all of its different purposes—investigation of problems from the field; testing for adaptability and platform support; benchmarking for performance—takes time and focus away from valuable development tasks. The testing role provides a heuristic for distributing and organizing the work of maintaining the test lab. People sometimes say “on an Agile project, everybody does everything” or “there are no roles on an Agile project”. To me, that’s like saying that there is no particular focusing heuristic for the services that people offer; throwing out the baby of skill with the bathwater of overspecialization and isolation. Indeed, “everybody doing everything” seems to run counter to another idea important to Agile development: expertise and craftsmanship. A successful team is one in which people with diversified skills, interests, temperaments, and experiences work together to produce something that they could not have produced individually. Roles are powerful heuristics for helping to organize and structure the relationships between those people. Even though I’m willing to do anything, I can serve the project best in the testing role, just as others serve the project best in the developer role. That’s the end of the article. However, my colleague James Bach offered these observations on roles, which were included as a sidebar to the article in the magazine. a one-size, exclusive, permanent, or generic structure. a unifying idea serving to focus commitment, preparation, performance, and delivery of services. a heuristic for helping people manage their time on a project, and to be able to determine spontaneously who to approach, consult with, or make requests to (or sometimes avoid), in order to get things done. a heuristic for fostering personal engagement and responsibility. a heuristic for defining or explaining the meaning of your work. a flexible and non-exclusive structure that may exist over a span of moments or years. a label that represents these things. You do not need acceptance criteria to test. Reporters do not need acceptance criteria to investigate and report stories; scientists do not need acceptance criteria to study and learn about things; and you do not need acceptance criteria to explore something, to experiment with it, to learn about it, or to provide a description of it. You could use explicit acceptance criteria as a focusing heuristic, to help direct your attention toward specific things that matter to your clients; that’s fine. You might choose to use explicit acceptance criteria as claims, oracles that help you to recognize a problem that happens as you test; that’s fine too. But there are many other ways to identify problems; quality criteria may be tacit, not explicit; and you may discover many problems that explicit acceptance criteria don’t cover. You don’t need acceptance criteria to decide whether something is acceptable or unacceptable. As a tester you don’t have decision-making authority over acceptability anyway. You might use acceptance criteria to inform your testing, and to identify threats to the value of the product. But you don’t need acceptance criteria to test.